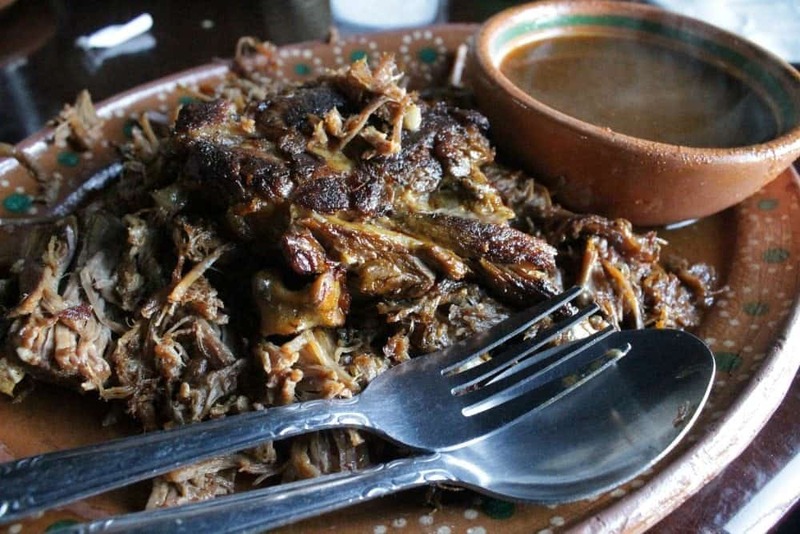 Borrego Tatemado, or Mexican Fire-Roasted Lamb, is a delicious and savory dish. Topped off with white onion, cilantro, lime, and salsa. A bite of rustic heaven from Mexico. Enjoy! I’ve talked about my maternal grandfather before in my Birria de Res post. My grandfather was also my padrino (godfather), a very quiet and extremely intelligent man. My family is from the state of Durango, but my grandfather was born in Zacatecas. If you’ve ever been to either of these two states, you might know what life is like outside of the big cities. In short, ranch life is – sombreros, wood fires, dirt roads, chickens roaming around, and shhhh… you can hear a pin drop! 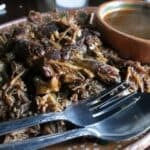 Recently, I visited La Cocina de Doña Esthela in the Valle de Guadalupe, and it reminded me of where I come from, especially after a bite of a dish I know very, very well: Borrego Tatemado, or Mexican Fire-Roasted Lamb. It doesn’t get any fresher than this. 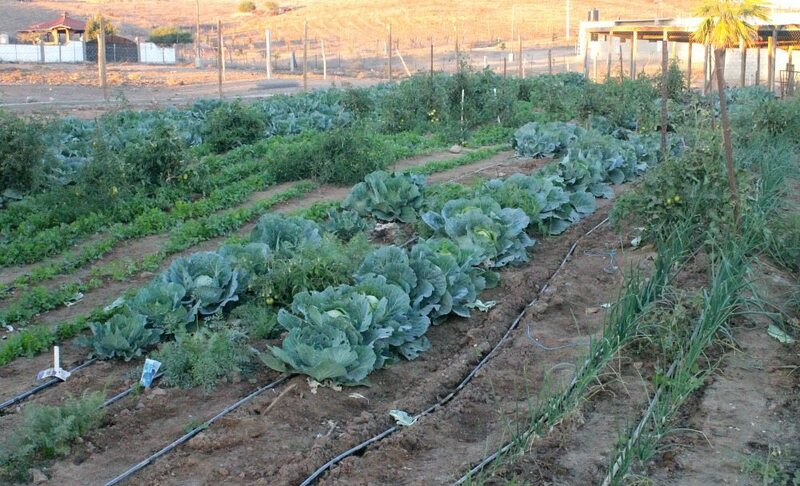 Doña Ethela raises her own vegetables as well as her own livestock – the pigs and other critters are very active, particularly at their dinner time. It’s a popular spot. If you want to visit during the weekend, you might have to wait to be seated. It’s also a very remote location, but any of the locals can guide you. FYI: Parking is limited, and the road to get here is not the best. Disclosure: This post contains affiliate links. Forget Farm-to-Table. Your table is at the farm. 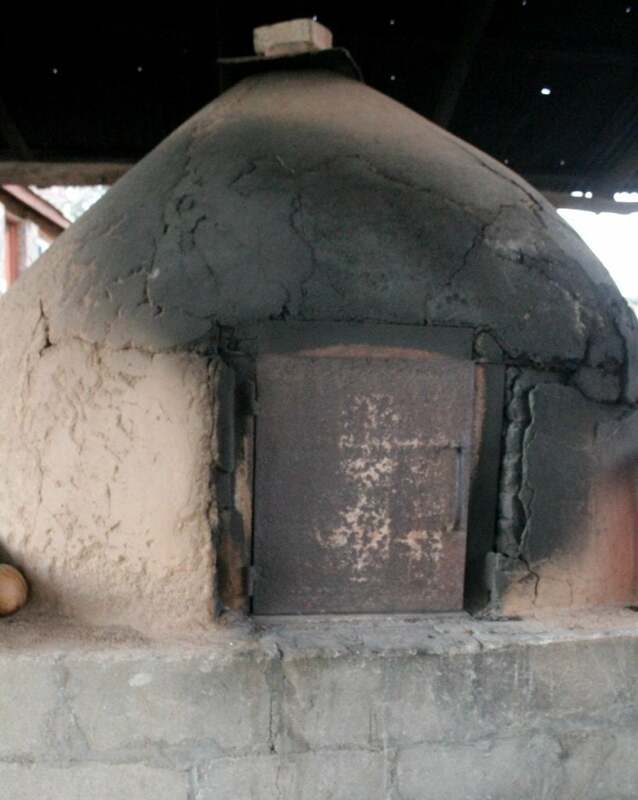 Some of the animals raised here are later cooked in this large clay oven. Tatemar (from the Nahuatl word “tlatemar”) means to put something in the fire. Traditionally, it is cooked in a beautiful Mexican clay pot . Don’t worry. You don’t have to add “Create a Clay Oven” on your husband’s “HONEY DO” list. The way we make Borrego Tatemado, or Mexican Fire-Roasted Lamb, in my family is in the oven. See recipe below. 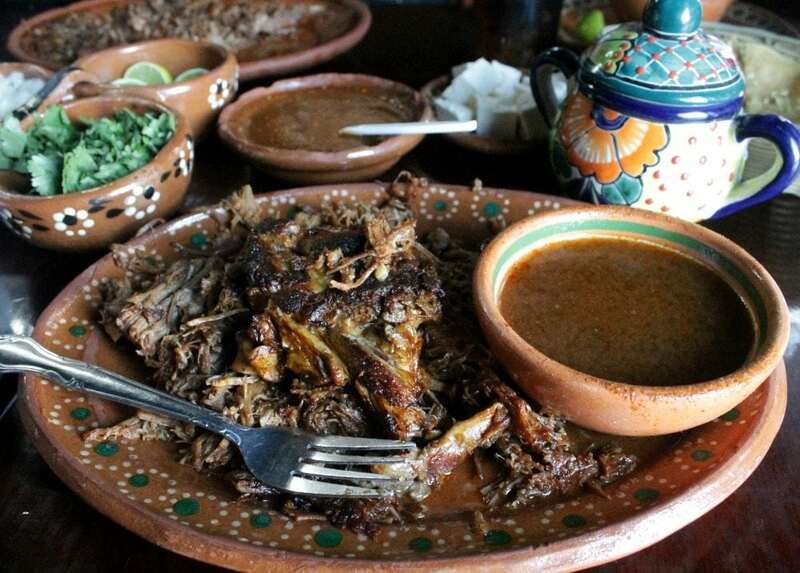 At the very end of the cooking, Borrego Tatemado, or Mexican Fire-Roasted Lamb, is basted with its juices. The lid is removed, then cooked for 15-20 minutes longer, or until the meat develops a char on the outside. The other way you can do this (and this is my preferred way, but you really gotta watch it) is to stick it under the broiler for 7-10 minutes. Don’t go away from the stove and take the latest Facebook quiz, or it can burn! You can use any type of lamb meat – leg, shoulder, with or without bones. 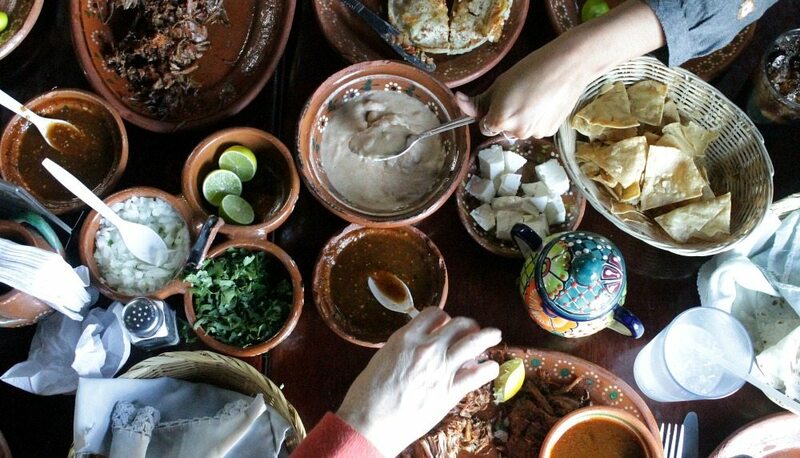 This is rustic Mexican cooking, and we don’t waste any part of the animal. Normally, this dish is not served with any juice, and it tastes amazing just on its own. Maybe it’s me, but I like my food saucy. Remove the meat from the pan, leaving the drippings. To the pot, add 1 cup of beef broth and bring to a simmer. Carefully pour the sauce into a small bowl or a gravy boat to serve with your food. If you can’t find lamb, you can also make this dish with roast beef. 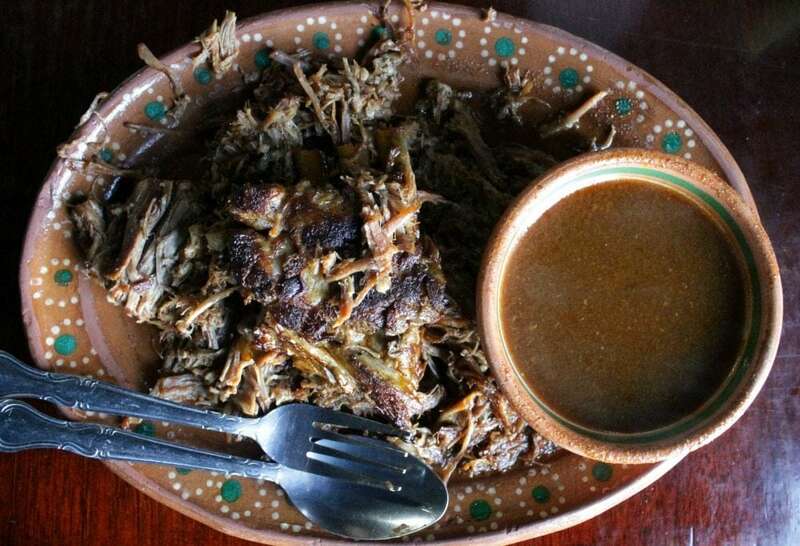 Top your Borrego Tatemado, or Mexican Fire-Roasted Lamb, off with some raw white onion, cilantro, lime, and salsa. Can’t forget the tortillas, and enjoy the deliciousness of this recipe in every bite. To be eaten with friends and family and lots of laughter. Place the lamb and 1 tablespoon salt inside a large container. Let sit for 30 minutes. This is to completely remove the blood. Meanwhile, toast the chile ancho and chile guajillo. Remove the stem from all the chiles. Then devein and remove as many seeds as possible. Add the chiles to a pot of water. Bring to a boil. Turn heat off. Let sit for 55 minutes. Add all the rehydrated chiles, onion, garlic, cloves, peppercorns, cumin, oregano, 1 tablespoon salt, vinegar, and ½ cup water to a blender. We are making a paste. If the blender needs more water, add only the amount necessary to get it to blend. Discard water from the meat. Pour the sauce from the blender onto the meat. Add 1 cup of water to the blender to get any remaining sauce. Gently rub the sauce all over the meat. Be sure to marinate every part of the meat. Cover and let sit overnight in the refrigerator. To a large Dutch Oven pot, add the meat and sauce. Cover with the lid and place in the oven. Baste the meat with liquid from the bottom of the pot. Return the pot to the oven uncovered and cook for an additional 15 minutes. (OR, place uncovered pot under the broiler for 7-10 minutes, until the meat is slightly charred. If you are doing this method, watch the meat carefully so it won’t burn). Again take out the pot and baste with the juices from the bottom of the pan. Grate fresh nutmeg over the top of the meat and return the uncovered pot to the oven for 5 more minutes, or 2 minutes under the broiler. Serve with raw white onions, cilantro, salsa, lime, and tortillas. Don’t want to make it at home? 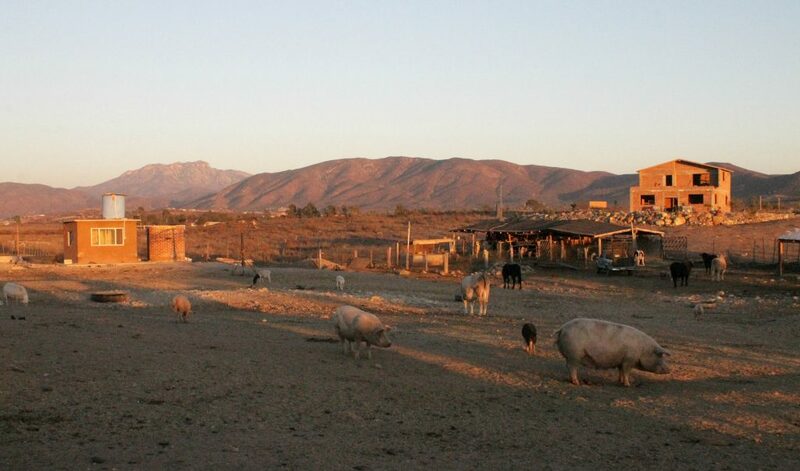 Visit La Cocina de Doña Esthela in the Valle de Guadalupe, Baja California, Mexico. Lamb meat? Which cut should I use? A leg, shoulder, what? Any and all. 🙂 You can use shoulder, leg, or better yet, a combination of all three. We’re talking rustic cooking. This recipe is making me super hungry and now I want to go and run to the supermarket and get all I need to make this for dinner during the Holidays!